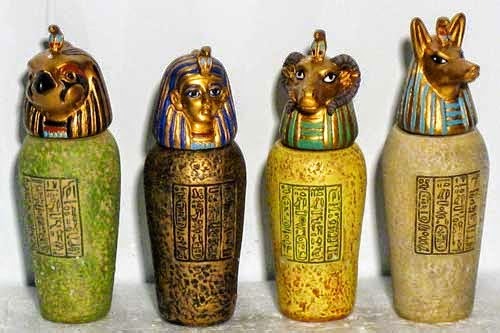 Canopic jars were used by the Ancient Egyptian from the time of the Old Kingdom up till the time of the Late Period or the Ptolemaic Period,as part of the mummification to store four main organs which would be taken out of the body and placed in special containers for the afterlife. 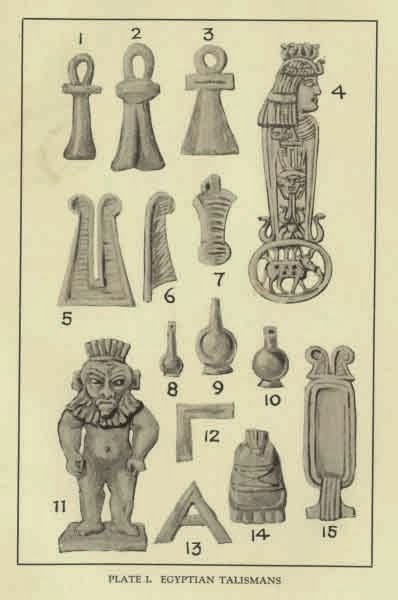 Each of these jars had the head of a different god known as the four sons of Horus and wasof a wide range of materials like pottery, precious stone, calcite, gold, bronze, wood limestone, etc. The type of material of the jars depended on the income of the owner and the size of the jars varied from 5 inches to 10 inches. 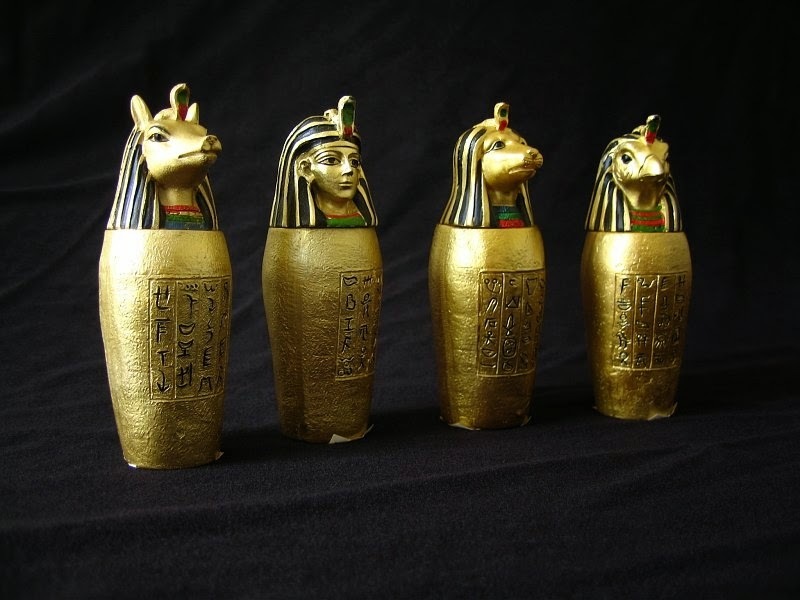 Canopic jars were an important part in the rituals of ancient Egyptians; the most prominent part was the mummification process. 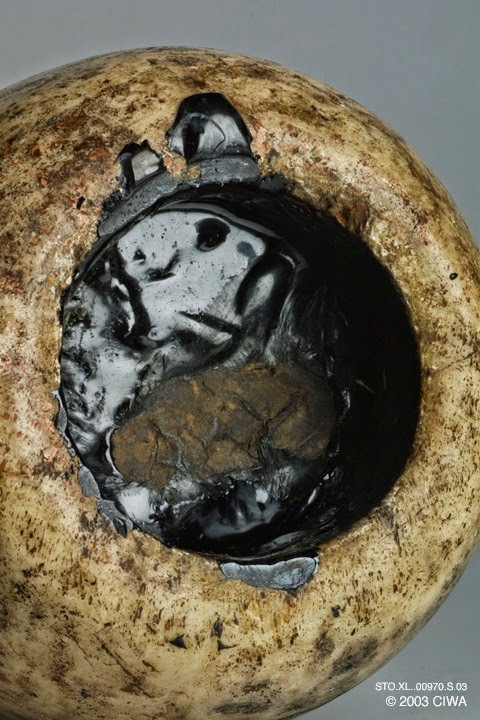 These containers were wide necked in which the internal organs of the deceased person were stored before mummifying the dead and the Egyptian’s belief in afterlife lead them to store the internal soft organs like the stomach, intestines liver and lungs in these jars. Each of these organs were stored in separate Canopic jars and the heart it is said was left inside the body since the Egyptian believed that the heart was the soul and it was weighed afterlife, to see if the person had led a good life. Initially there were plainly decorated jars and with passage of time,they gradually changed to beautifully designed jars with different styles and shapes. There is a lot of debate on the origin of the term `canopic’ which has led some to believe that an ancient Egyptian port called Canopus, east of Alexandria and whose inhabitants worshipped Osiris was the Egyptian god of the dead and that the name canopic had derived from this source. 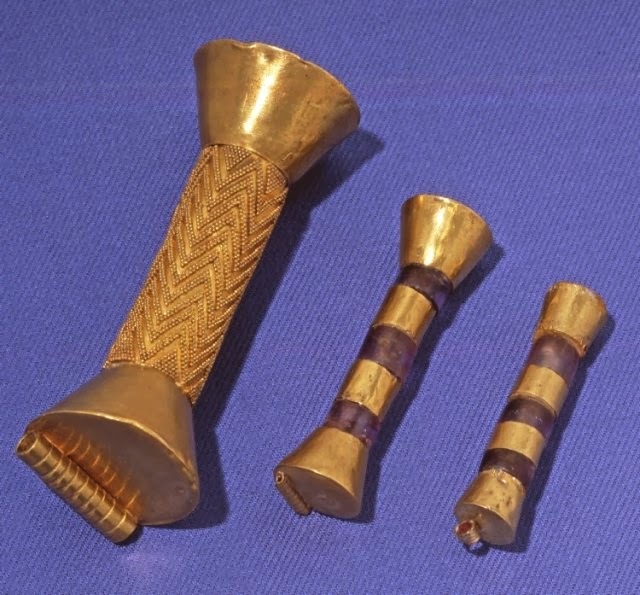 These jars had lids which were in the shape of a head of one of the minor funerary deities and the jar containing the stomach was protected by the goddess Neith with Duamutef as the patron. 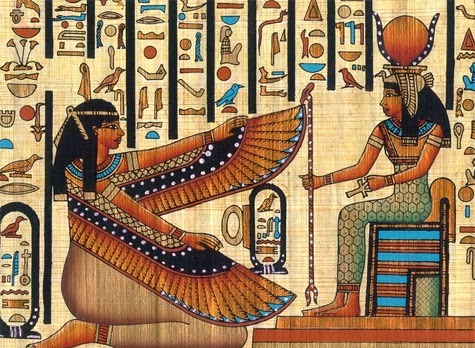 While Qebehsenuef was the patron of the jar containing the intestines, it was protected by goddess Selket, and Goddess Isis protected the jar containing the liver which was patronised by Imseti. The god Hapi whose jar had the lungs were protected by the goddess Nephthys and the name of the protective deities were mostly written on the jar with a magic formula to invoke the powers of the gods. At times the lids of the jars had shapes as their heads where Imsety’s head was of a human, while Hapi’s head was that of a baboon. Dyamutef’s head being that of a dog and Qebehsenuf’s that of a falcon. The organs which were individually wrapped in linen were placed into canopic jars with consecrated oil poured over them after which the jars were closed and preserved. 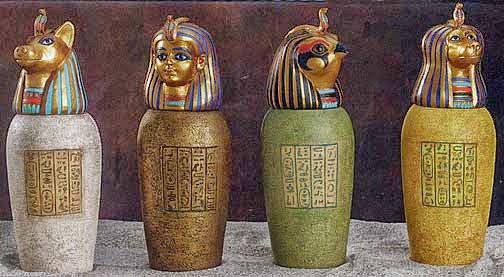 The jars were placed in a canopic box or chest and the simple canopic chest having flat or vaulted lids resembled shrines. 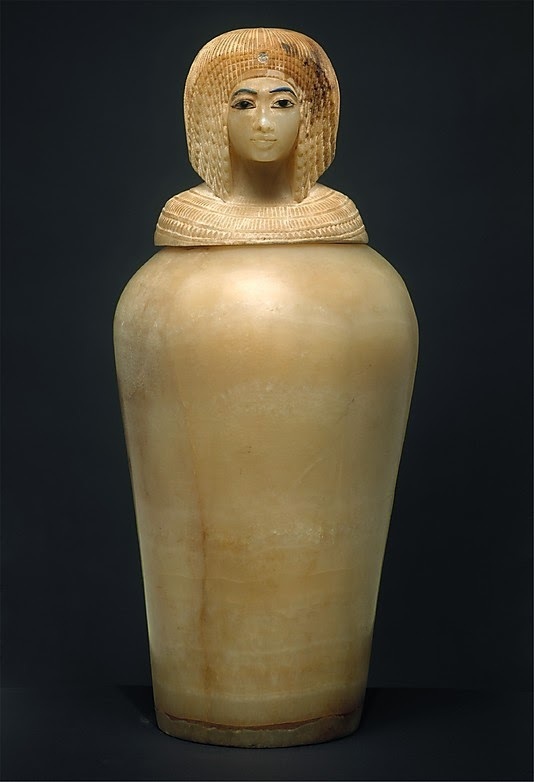 The jars were buried together though kept separate from the mummified body and in the pyramids built during the Old Kingdom, these canopic jar were placed often in shallow pit near the sarcophagus and then covered with a slab. In the Grand Old Library of Alexandria we find the largest source of information during the middle Egyptian era with detailed study of ancient Egyptian religious topics of divine power and witchcraft. Ancient Egypt believed in various occult procedures, magical spells and recitations and of all civilization ever known in history, Ancient Egypt is the most marvelous and fascinating country, rich in occult significance yet to be unraveled. Many have debated on why the Egyptians, who had no belief in resurrection, took so much effort in preserving the bodies of the dead for eternal life in paradise after their earthly journey had ended. This explanation can be sought from the famous Book of the Dead which represents the convictions that prevailed during the Egyptian civilization from pre dynastic times. Between 4000 and 2000 BC, the worship of Amen Ra who was considered the greatest god of the Egyptian was established at Thebes and it became the central religious teaching. Their priest became very powerful till the high priest of Amen which means the `hidden one’, became the king of upper Egypt and was regarded as the creator with all the attributes and power of Ra the sun god as well as the ruler of lesser gods. One of the most known symbolic figures is of Isis who was the moon goddess and the traditional queen of Egypt while Osiris was her husband. It is related that Isis was the sister, wife and mother of Osiris which is a mysterious and strange relationship. Princess Karadia in her book of King Solomon relates how Osiris was killed by his brother Typhon, the spirit of evil who dismembered and scattered him into fourteen fragments and how Isis his widow, heartbroken patiently sought all the fragments and her son Horus as he grew to manhood challenged and conquered Typhon or Set as he is also called. Typhon symbolizes decay, autumn and destruction while Osiris signifies light, springtime and the fertilizing and growing powers of nature. 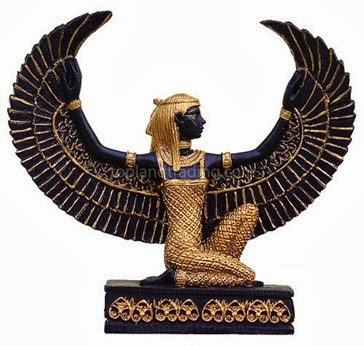 Isis is signified in various forms but revered as the goddess of procreation, protector of the spirits of the dead and universal mother of the living. The cow is her symbol and she is depicted wearing the cow’s horns with the orb of the moon between them. Egyptian witchcraft had great influence on the lives of ordinary people and they believed in these powers to provide solutions to their difficult problems in life relying on a set of rigid and sound principles which controlled the mortal as well as the immortal world. 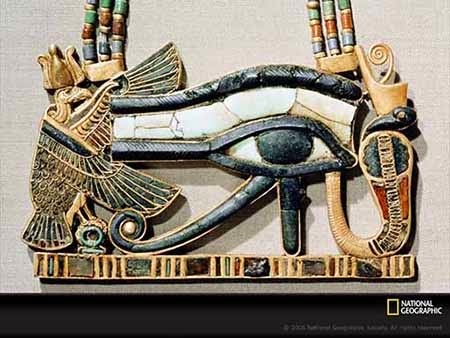 This implied the gateway or mouth, and the creative power is signified by the loop representing a fish’s mouth giving out water as life to the country which was regarded as the key of the Nile fertilizing the land by overflowing periodically. 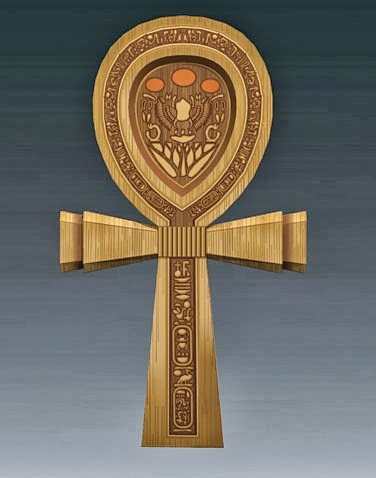 It also had reference to spiritual life since it was from the Ankh or the Crux Ansata that the Venus symbol originated and the circle over the cross, the triumph of spirit represented by the circle. 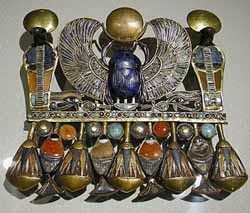 The Menat another symbol was dedicated to Hathor and was worn to gain power and strength in promoting health and fruitfulness of offspring and formed as a necklace which was elaborately ornamented. Besides these, the Two Plumes were sun amulets, the symbols of Ra and Thoth with two feathers being the two lives, spiritual and earthly. They were symbols of the great gods representing light and air and were worn in order to promote enlightenment, uprightness in dealing and morality. The Single Plume the female counterpart of Thoth, an emblem of Maat, was the personification of integrity, truth and righteousness and the Cartouche or Name Amulet was worn to prevent the name of its wear from being blotted out in the next world and to secure favor, remembrance and recognition. It was believed to be an important amulet since the name was considered being an integral part of man, the absence of which would not permit the soul to come before God and hence it was essential that the name to be preserved to be entered in the Book of the Dead. The Heart believed to be the seat of the soul was worn to prevent the soul from being bewitched out of the body by black magicians. They realized the importance of these charms from the belief that, should the soul leave the heart, the body would die and fade away and hence according to the Egyptian belief, at the time of judgment of the dead, the heart is weighed and if found perfect, it returns to its owner recovering his powers and being his own master with strength and everlasting felicity in his soul. The Plummet and the Angles amulet were symbols of Thoth god which were worn for wisdom, moral integrity, knowledge, truth and order and Thoth was personified as law and order, the inventor of all arts and sciences and the god who worked the creation as decreed by god Ra. He also knew all the words of power as well as the secrets of the heart and was probably regarded as the chief recording angel. The Tat which held great importance in the religious ceremonies of the Egyptian formed the centre of their annual ceremony to commemorate the death and resurrection of Osiris and this symbol represented the building of the backbone and reconstructing the body of Osiris.